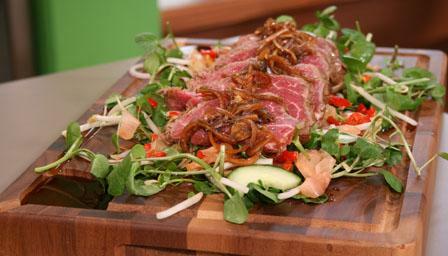 Beef up your salad recipe repertoire with delicious Japanese flavours. Rub the beef with oil and season with salt and freshly ground black pepper. Heat a heavy-based frying pan and fry the beef for one minute on each side. Remove from the pan and set aside. For the marinade, mix together all the ingredients in a bowl until well combined. Place the meat into the bowl and massage the marinade into the meat. Transfer the meat and marinade into a sealable plastic bag and leave in the fridge to chill for at least two hours. Meanwhile, for the dressing, whisk together all the ingredients in a bowl until well combined.. Arrange the salad on individual plates, or a large wooden board, and spoon over the dressing. Once the meat has been chilled, slice it very thinly and arrange on top of the salad.